Benedictine Monks came to Alabama from St. Vincent Archabbey in Latrobe, Pennsylvania in the 1870’s. St. Vincent had been founded in the 1840’s from Metten abbey in Bavaria, a monastery founded in the 8th Century. Most of the early Alabama monks were Bavarian natives and came primarily to serve German-speaking Catholic communities in the State. The town of Cullman was such a community and was settled in 1873 under the leadership of Colonel John G. Kullmann, a German refugee who arrived in America in 1866. 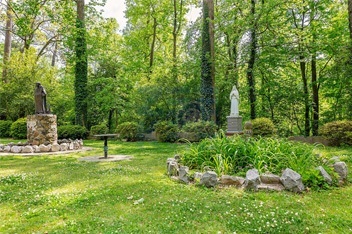 Arriving in Cullman in the 1880’s the monks established St. Bernard Abbey on September 29, 1891, named in honor of St. Bernard of Clairvaux, the famous eleventh-century French abbot and doctor of the Church. The new community chose its location because of the area’s healthy climate, rapid growth, and access to the mail railroad. In the same year as the Abbey’s founding, the Monks established St. Bernard Preparatory School on the outskirts of the city – on the grounds of the monastery. The school was chartered by the State of Alabama in February 1893, and though primarily a college preparatory school, including middle school grades, St. Bernard regularly conferred a few bachelor’s degrees. Responding to local needs, in 1929 the Board of Trustees elected to establish a formal junior college program in addition to the high school; then some twenty years later the establishment of a senior college was accomplished. Also during its history St. Bernard has educated many young men for ordination to the priesthood through its seminary programs from high school through graduate studies. In 1962 the Board of Trustees made the decision to discontinue the preparatory school program. Post secondary education continued until May 13, 1979. In the autumn of 1984, St. Bernard returned to its origins with the re-opening of St. Bernard Preparatory School as a co-educational secondary school for boarding and day students. In the Spring of 2007 the decision was made to admit seventh and eighth grade students to the new Middle School at St. Bernard in August of 2007, again returning to St. Bernard’s late 19th century roots and the Minims (Middle School) program that was in existence for decades. The Abbey takes pride in its thousands of students who have shared in the Benedictine way at St. Bernard, the way of prayer and work, the way of knowledge and love.